I know most of you are heading into spring, but it is autumn here, and winter will soon be upon us. Except where I live the only change between the seasons is the speed the grass grows at. It really doesn’t get cold, no gorgeous autumn colours. Where I travel to a lot for work it does ! In winter I absolutely adore argyle, argyle jumpers, argyle vests, argyle diamonds (subtle hint in case hubby has a peek), and I have had a few goes whilst laid up with this ankle at creating an argyle pattern but not been happy with it. I am finally a little happier with this one. I have spent way too much time staring at jumpers and vests LOL at all the different variations, and this is one of them. 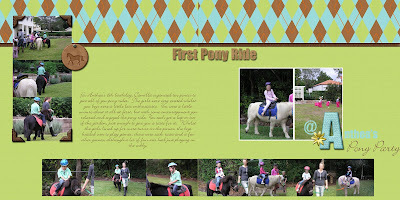 These pages I did last night were for my son’s first pony ride at a friend’s birthday party last year. Her oldest sister is a keen rider and so they brought some ponies in to the yard to give the kids some pony rides. The boys weren’t as excited as the girls BUT the noisy woisy boy-zy still had a go. Unfortunately on that winter day it was overcast and the light was a pain so a lot of my photos didn’t turn out well. It was a lovely party and my friend even had some extra fertiliser for her roses at the end of it ! A couple of add ons I created are available for you here. 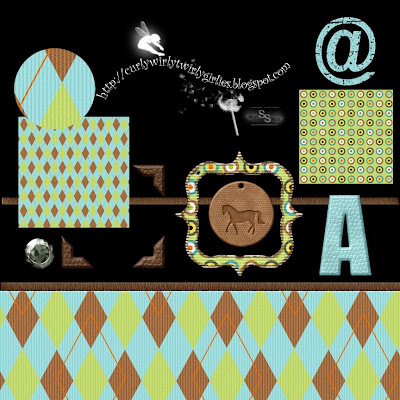 There is the argyle paper in a cord texture, a half page of it with an embroidered edge, the edge on its own, a letter A monogram, an @ rub on, some photo corners, and the horse tag. I also threw in a paper and frame I was playing with using Rachel Stutts commercial use patterns. More colouring in for grown ups. Ankle is still painful today but there is so much I need to do around the house, very frustrating. Very cute! I love the argyle!! Thanks so much for sharing :) I hope your ankle heals quickly!! love the argyle! and the circle paper! and the pony tag! and the leather photo corners (yes, more leather, lol!) and all the new goodies!!! tfs!